library night, originally uploaded by jahansell. It's TV Turn Off Week and Sharon observes it with a week of evening activities for kids. 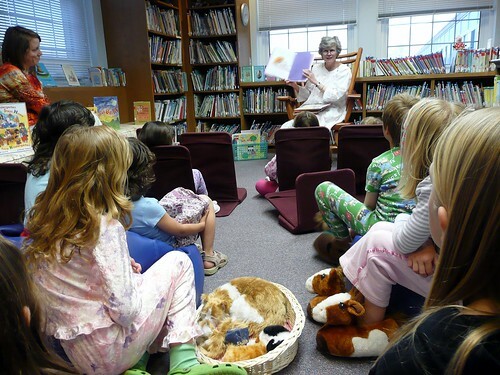 Last night the school librarian invited everyone to come in PJ's and slippers for some stories (she wore her nightie too.) Tonight was Bingo night (I wasn't there, so no pictures, but the kids had fun) and more to come as the week goes on. The kids were a bit grouchy at first and I didn't quite realize how much extra work it would be for me to make sure they had something to do - during the after-school hour when they're plopped in front of Spongebob, I have time to tidy up, make dinner and blog a bit. But not this week - blogging and blog-visiting must happen late at night, like now! Good idea a T.V turn off week... a great chance to interact with one another in real human terms..
this is fantastic. spongebob might be cute and funny but he's a bad babysitter. A good babysitter is one who reads to the kids or takes them outdoors for a walk or something. What an interesting idea. I hope they never do a No Blog Week! Is that a basket of cats in the foreground?! That is SO cute! Oh, apropos the topic, I haven't had a TV in the house since, um, 2000?